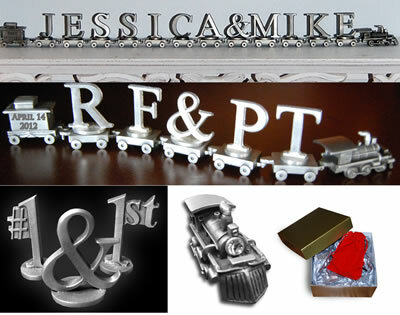 This hand-crafted, personalized pewter train is a fun gift to celebrate a marriage that will be a highlighted decoration over time. 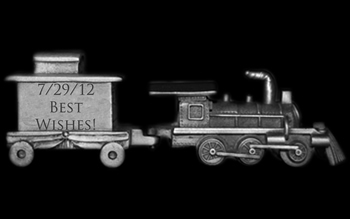 At each anniversary, the couple will enjoy seeing the pewter train on their bookshelf! The train cars spell out the couple's names and the caboose can be engraved with the wedding date and your own personalized text. The train pieces are packaged in a velvet bag with a gold gift box for a beautiful gift presentation. 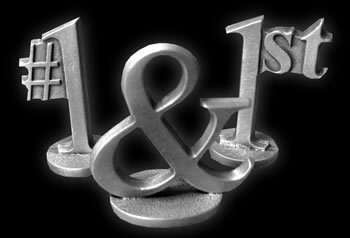 - Made of genuine, lead-free pewter. 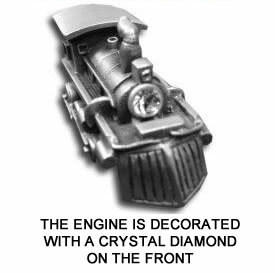 - The engine is decorated with a crystal diamond on the front. - The caboose can be engraved with your special text. - Each train car holds one letter, number or special character. - Engine, caboose and three cars included. 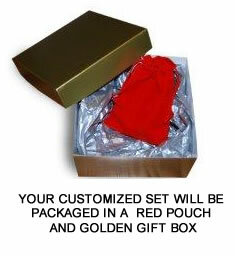 - The train pieces are packaged in a velvet bag with a gold gift box for a beautiful gift presentation. - Engine and caboose are included in your order. - Engine cannot be personalized, but the caboose can be personalized. - Caboose holds up to 4 lines with 16 characters per line. The text is etched directly onto the caboose and not painted black. The Image Gallery shows the etching with black fill so that it can be easily viewed on a computer screen. - Caboose: 1-1/2" x 1-1/4" x 7/8". Engraving area: 1" x 1/2". " - Train car: 1-1/2" x 1-3/4" x 7/8"
Packaging: The train pieces are packaged in a velvet bag with a gold gift box for a beautiful gift presentation. Please view the Image Gallery. The quality of this train and being able to engrave the wedding dates and names made it easy to a wonderful gift for my niece.